I was excited to find this little known small spider wasp with banded wings. The photos are of poor quality, as the wasp, like typical spider wasp (female)s, kept nervously moving around. They reveal just enough detail to ID it to subspecies. Ironically, it got stuck in a cobweb spider (Pholcus phalangioides) web, who started to entangle her. She was however strong enough to break free after a little while. 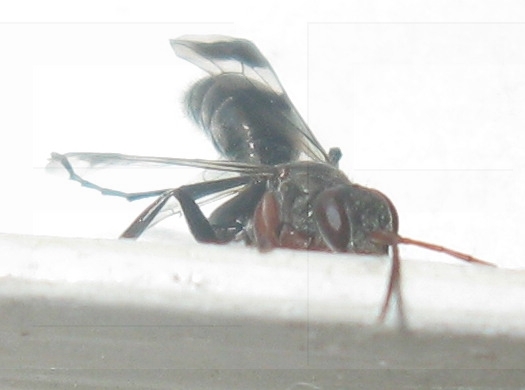 Does anybody know the behavior of male spider wasps? Do they not move about nervously (in a searching fashion), as they don't need to stock their nest with prey? I appreciate an ID confirmation, and if correct, a move to a subspecies page.